90% Merino wool foot on the khaki sock and moisture wicking on the black liner sock work together to provide the maximum thermal regulation to keep your feet extra warm, comfortable and dry in extreme cold conditions. Sock and liner system comes with 1 pair of black liner socks and 1 pair of merino wool khaki socks. 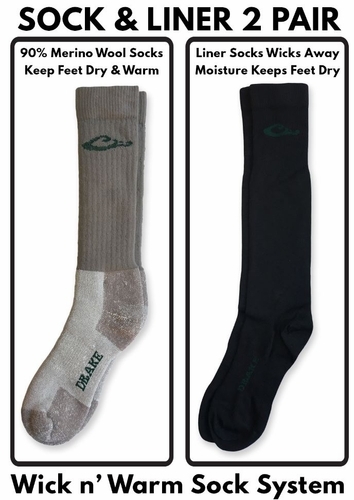 The black liner socks have wicking featues that pulls moisture away from the foot to keep feet and sock dry while the khaki socks is knit with premium thermal insulated 90% merino wool foot with a natural moisture wicking feature that allows wool blend to dry fast and keep feet comfortable and warm for long hours. Ultra soft thick 40% merino wool, 40% acrylic, 15% nylon, and 5% spandex blend provides natural odor-free and itch-free protection. These heavyweight, strong, durable tall boot socks are designed to withstand all climates with reinforced heel and toe that delivers added durability during extended wear for a long lasting sock life. Khaki socks have full cushion leg and foot that is designed to provide optimal padded comfort, performance design includes stay-up top to keep socks from sliding down with arch support that provides added fit to keep socks in place so there is no slipping and bunching. Insulated merino wool provides enhanced comfort to keep feet extra comfortable for hunting, hiking, camping, trekking, trail walking and outdoor activities.